Since leaving Adelaide, robotics expert Zoz Brooks has landed a role on the Discovery Channel and is taking electronics 'hacking' to Korea, as DAVID ELLIS reports. "I'm a nerd and I'm completely proud of it," declares Dr Andrew 'Zoz' Brooks. A robotics, computer science and engineering expert, Zoz, as he's commonly known, is making a name for himself in more ways than one. Recently he was one of the hosts of the television reality show Prototype This! which aired around the world on the Discovery Channel in 2008 and 2009. 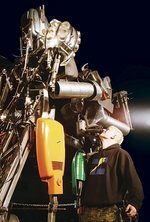 The program, made by Australian company Beyond Productions -- the same company that made MythBusters and Beyond 2000 -- followed a team of inventors whose job was to build a range of engineering prototypes that could have future applications. With ideas seemingly inspired by science-fiction film and television, these prototypes included a mind-controlled car, a truck that lifted up over traffic to avoid congestion and a robot that would carry firefighting equipment into high-rise buildings. Zoz (his name is the result of a pseudonym that has stuck over the years) says getting involved in television has helped to raise awareness of science and technology in a fun way. "Engineering outreach is really a key issue for me," he says. "It's about helping people to feel the same way I do about science and engineering - that it's cool, it's fun. It doesn't have to be a grind, it's not just sitting in a cubicle doing a lot of maths all the time. You can create art with it, you can build things, it pervades every aspect of your life, if you let it." Zoz is a three-time graduate of the University of Adelaide. 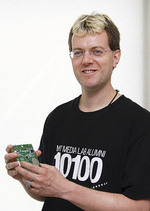 He received his Bachelor of Science degree with majors in Organic Chemistry and Computer Science in 1993, followed by First Class Honours in Computer Science in 1994 and a Graduate Diploma in Education in 1995. From there he studied for a Masters at the Australian National University's newly established robotics laboratory, before moving to Boston to do a PhD at the Massachusetts Institute of Technology (MIT). In the Robotic Life group at MIT's Media Laboratory he conducted research into human-robot communication on a range of projects, such as contributing to NASA's 'Robonaut', a humanoid robot designed for space walks. "It's been fantastic," he says of his 11-year stay in the United States. "MIT is an amazing place; it's full of people that are proud to be nerds." Zoz has worked on a range of creative projects including a video game called War Face that uses computer imaging to recognise movements in the game player's face. This work was presented at a conference as an example of tele-rehabilitation for sufferers of cerebral palsy and also went on display in an art exhibition in Thailand. 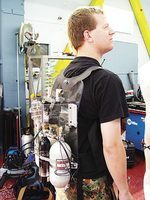 Some of his other creations that cross over from engineering into the world of art are the Funkenschnorkel - a backpack device that allows the wearer to broadcast music - and the Schallfaust and Luftwerfer - two large "toy weapons for adults" that use Coke bottles and compressed and liquefied gases to create harmless (but very loud) pyrotechnic-style explosions. The Schallfaust was inspired by a conversation Zoz had with famous Chinese pyrotechnic artist Cai Guo-Qiang. "One of the most interesting and rewarding projects I've been involved in over the last few years was working on developing improved tools for humanitarian land mine clearance," he says. "This work has, in many ways, a greater real-world impact than TV, art or robots. There are spheres like this that all university graduates, regardless of their field, can make a difference in if they're made aware of them." Having moved on from MIT and Prototype This!, Zoz has made some appearances on another Discovery Channel show, Time Warp, and is involved in a number of new projects that combine engineering and art. He also has links with the Korea Advanced Institute of Science and Technology (KAIST) and has taught a course there mysteriously called "Ubiquitous Hacking". "The 'hacking' side of it isn't malicious computer hacking - it's about taking everyday electronic objects and making them do things that they were never explicitly designed to do, adding sensors, micro-controllers and other electronic elements to them," he says. "One of my students, for example, turned a laser printer into a music machine - it would print patterns of black-and-white squares, and as that page came out of the printer, an array of photo-detectors would read the patterns and play tunes. "It's all about having fun but also learning from what you do, which is the key to just about everything I'm involved in." Zoz Brooks says his interest in science and academia began at a very young age. "My parents both had PhDs and both worked for the University of Adelaide - my mother (Dr Rosemary Brooks) lectures in architecture and my dad (Dr David Brooks) worked at the Waite Campus," he says. "By sheer chance I was born in the US, but my parents were from Adelaide and I grew up there. It didn't even occur to me not to go to the University of Adelaide - this great university was just down the road, so that's where I was going to go. I didn't even think of it as being a choice. "I was also very lucky because my mother was the principal of St Ann's College, and I had that residential college experience. Being immersed constantly in the university life since high school, and in the academic life through my parents, was immensely valuable." Zoz's first love was chemistry but he also discovered a love of computer science at the University of Adelaide. "I became immersed in that scene in the Computer Science department - there was a social scene as well as an academic scene going on there, and I found myself spending a lot more time in the computer lab than I was in the chem lab." He says his Honours year gave him focus as a student. "That's when I really decided what I wanted to do. There was a lot of interaction with the faculty. You'd even - and this is very uncommon in the States - go out and have some beers with some of the lecturers, with whom I had a lot of fun at Adelaide. That's one area where I think the system here (in the US) doesn't quite work right," he says. Zoz with giant boxing robots from the Discovery Channel TV show Prototype This! Zoz wearing a personal 'airbag' designed to protect construction workers in case they fall from high-rise structures.